Nivruttibua Sarnaik was born in Kolhapur where his father, Tukarambua Sarnaik, was a well-known singer of bhajans of his time. At the age of five, his uncle, Shankarrao Sarnaik took him under his wings and brought him to a drama company, where he played various roles and also travelled extensively. During his days in the drama company, Nivruttibua was imbibing the gayaki of his uncle, Shankarrao Sarnaik, who was a disciple of Sawai Gandharva and Govindrao Tembe. Then his formal training started under Govindbua Bhave, after which he became a disciple of Sawai Gandharva. Subsequently, he also received training from Rajab Ali Khan of Dewas, who apart from being a khayaliya also played multiple instruments and was well-known for his taankaari. His final grooming was under the direct tutelage of the great Alladiya Khan himself, whose gayaki became the base for Bua’s music. Nivruttibua was also an excellent tabla player, having learnt it in his initial years from the tabla accompanists of the drama company, Rukdikar and Babalal Islampurkar. Afterwards he learnt the nuances of the tabla from many distinguished visiting tabla maestros, including the legendary Ahmedjan Thirakwa Khan and Natthu Khan. With his sweet and malleable voice, Nivruttibua evolved a distinctive style of his own, which was marked by an eclectic approach, constantly improvising, even while it maintained its moorings firmly in purism. A blend of Kirana and Jaipur-Atrauli gharanas can be seen in his gayaki. He was deeply influenced by Amir Khan, the Kirana-Indore gharana vocalist, as he himself used to acknowledge. As a result of his training in tabla, Nivruttibua had an exceptional understanding of laya and tala. He could strike the most appropriate balance between melody and rhythm, which had a significant bearing on his unique style and richly enhanced the aesthetic appeal of his music. His rhythmically complex and articulate taan patterns had a unique charm. Nivruttibua’s avid passion for music can be seen from the fact that he collected innumerable bandishes from diverse sources (apart from his gurus, he got bandishes from Ashiq Ali Khan, Hafiz Ali Khan – the legendary sarodiya, and others) and gharanas, including Gwalior and Patiala. 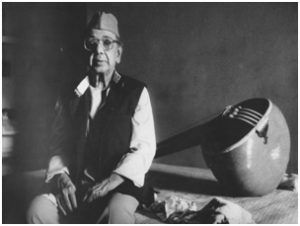 He molded many bandishes of Kirana gharana into a framework of Jaipur gharana. He sang some of his bada-khayals in vilambit Ektal; he also sang chhota–khayals, which were rarely sung in Jaipur gharana during those days. He has also sung many ragas which are usually not sung by the artistes of the Jaipur gharana. He was a composer of great merit and made chhota–khayals in ragas that had only the bada-khayal – ‘Kit Dhundan Jaun’ in the raga Sampoorna Malkauns, ‘Mai Janori Tori Chaturai’ in the raga Dagori, for example. He also made several other compositions. Between 1969 and 1979, he was an Honorary Guru in the Music Department of Mumbai University, after which he served as a senior guru in ITC Sangeet Research Academy in Calcutta for 12 years. He has groomed top-class musicians and performers. His list of disciples includes Sardarbai Kardgekar, Appasaheb Deshpande, Dinkar Panshikar, Prabhdev Sardar, Vijaya Jadhav-Gatlewar, Bharati Vaishampayan, Madhuri Oak, Madhusudhan Apte, among many others. Musicians like Jitendra Abhisheki, Kishori Amonkar, Arun Kashalkar, Ulhas Kashalkar, Padma Talwalkar, Prabha Atre, Veena Sahasrabuddhe, and others who received his invaluable guidance have been greatly benefitted. Sangeet Natak Akademi Award in 1979. Tansen Samman from the Government of Madhya Pradesh in 1986. Benaras Vishwa Hindu Parishad Award in 1988. Maharashtra Gaurav Puraskar from the government of Maharashtra in 1990. He had the honour of being the Darbar Gayak of Kolhapur State. Nivruttibua was a veteran concert artiste and broadcaster of AIR. In addition, Kolhapur Municipal Corporation, Calcutta Music Circle, Goregaon Music Circle and Prayag Sangeet Samiti have appreciated and honoured his contribution towards Indian Classical music.